Thank you for installing Image-Details for Google Chrome™. If you find an error, have a feature request, questions, or kind words for me, please send an email to heithe.dev@gmail.com. If Image-Details is beneficial for you, please consider making a donation to the same email address using Paypal. Thank you very much! 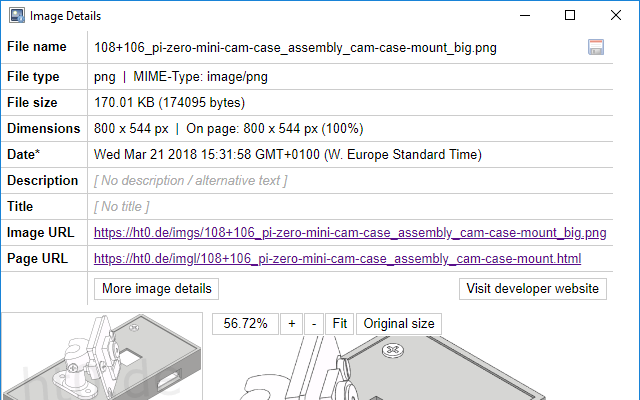 Image-Details for Google Chrome™ was updated. Please read the following introduction to see what has been updated and how to use it. Image-Details for Google Chrome™ was uninstalled. If you like you can mail me your uninstall reason to heithe.dev@gmail.com. Maybe I can improve Image-Details with the next update. If there is a problem the following introducton can solve, you can re-install Image-Details from Google Chrome™ Webstore at any time. This extension adds a context menu entry that will show image details in a popup window. It will work on images that are included using the <img> HTML tag and on most images that are included using the CSS background-image property. In addition to that, you can download the image by clicking the little save icon on the right end of the file name. The old version had more and more issues with loading the image and indefinitely displaying "loading" in the popup window. With this rewritten version all those issues should be solved. Another thing the old version couldn't handle but this new one can were images that are included using the CSS background-image property. The date shown in this field is the date the server reported while sending the image to you. Depending on the server configuration this may be the date of image creation, the last modified date or even just the date of sending. The button "More image details"
I am currently writing a little tool that can read the EXIF data of images and shows the most common data fields. The parsing works already fine and now I have to decide which fields to show. So if you have any fields that you would like to see, please let me know. If you found bugs, have feature requests or comments on this extension, please write me an email to heithe.dev@gmail.com. If you like this tool, please support me with a donation to heithe.dev@gmail.com using PayPal. If you like this Chrome extension, maybe you like my others too. Like my Image-Toolbar, Tab-Sidebar, Open-as-Popup and Color-Converter. There is more on my website www.ht0.de.